AMSTERDAM, The Netherlands, September 19, 2013 (ENS) – In a shallow sea on Russia’s northwest coast, the Russian Coast Guard today boarded the Greenpeace International ship Arctic Sunrise and is arresting the 25 activists on board. The boarding and arrests were triggered by a Greenpeace protest against the Arctic oil and gas drilling operations of Gazprom, the world’s largest extractor of natural gas. The Russian government controls most of the Gazprom shares and private parties hold the rest. Today, using a helicopter and ropes, armed Coast Guard officials boarded the Greenpeace icebreaker and rounded up the activists, assembling them on the helideck. Greenpeacers locked inside the radio room said they saw other activists detained on their knees with guns pointed at them. During a protest action Wednesday, Russian Coast Guard personnel arrested and held without charge two Greenpeace International activists who had scaled Gazprom’s drill platform in protest of Gazprom’s oil and gas extraction activities. “We are unsure of the whereabouts of the two arrested. This has been part of the problem – we’ve had no communications about it. 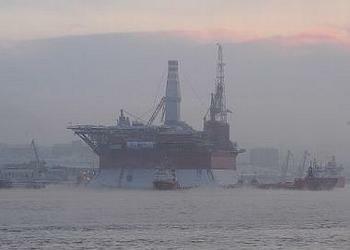 Our lawyers and several embassies were working on this info overnight,” Greenpeace spokesperson Keiller MacDuff told ENS. At the time of the boarding today, the Arctic Sunrise was circling Gazprom’s Prirazlomnaya platform at the three nautical mile limit, in international waters of the Pechora Sea. The coordinates at the time of the boarding were: 69-19-53N : 57-16-53E, a location within Russia’s Exclusive Economic Zone. Greenpeace says this location makes the boarding illegal because the UN Convention on the Law of the Sea guarantees foreign vessels freedom to navigate in the Exclusive Economic Zone of another country without interference. “We ask President Putin to restrain the Coast Guard and order them to holster their guns and withdraw. We are a peaceful organization and our protest has done nothing to warrant this level of aggression,” said Naidoo. Gazprom plans to start production from the Prirazlomnaya platform in the first quarter of 2014. Greenpeace warns that production from this platform raises the risk of an oil spill in an area that contains three nature reserves protected by Russian law. 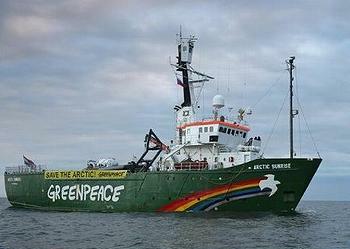 The Russian Ministry of International Affairs earlier claimed the Coast Guard intervened during Wednesday’s protest because the Arctic Sunrise represented an environmental and security threat – a claim that Greenpeace International disputes. “The Coast Guard has boarded our vessels with guns, threatened our activists at gunpoint and fired 11 warning shots across our ship, so who is the real threat to safety here?” asks Ben Ayliffe, head of Greenpeace International’s Arctic oil campaign. “Drilling for oil here in the Arctic is a grave environmental risk that must be stopped and this is why Greenpeace International came here, taking peaceful action to defend the environment on behalf of the millions of people around the world who are opposed to drilling operations,” Ayliffe said. But Gazprom has big plans for development on the Russian Arctic shelf. On September 10 in St. Petersburg a Gazprom official detailed those plans at the 11th International Conference for Oil and Gas Resources Development in the Russian Arctic and CIS Continental Shelf. Valery Golubev, deputy chairman of the Gazprom Management Committee, told the conference that offshore developments are Gazprom’s strategic objective. “Gazprom is Russia’s most prepared company that has the experience and technical means for independently implementing offshore projects in the Arctic: from geological and geophysical studies to field commissioning,” said Golubev. Between 1995 and 2012 Gazprom drilled over 30 exploratory and prospecting wells and discovered seven new oil and gas fields. In 2013 the company plans to start production from two fields – the Prirazlomnoye oil field in the Pechora Sea and the Kirinskoye gas and condensate field in the Sea of Okhotsk. The Prirazlomnoye development would become the first hydrocarbon production project in the Russian Arctic shelf.